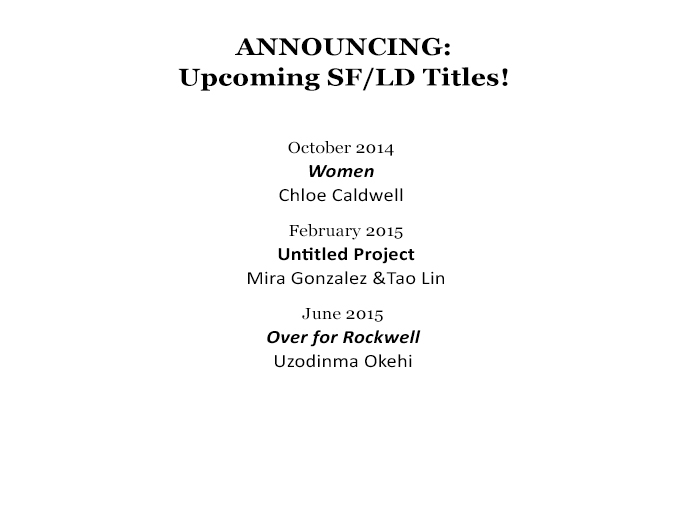 We're super excited to announce our next three Short Flight / Long Drive Books titles!!! Women is a semi-autobiographical novella focusing on grief, sexual confusion, female friendship and bisexuality. Chloe Caldwell is the author of the essay collection Legs Get Led Astray (Future Tense, April 2012). Her work has appeared in The Rumpus, Salon.com, Hobart, The Sun and Men's Health. Her essays are included in the anthologies Goodbye to All That: Writers on Loving and Leaving NYC and True Tales of Lust and Love. Chloe lives in Hudson, N.Y.
Tao Lin (b. 1983) is the author of 7 books of fiction/poetry including Taipei (2013) and Richard Yates (2010). He founded and edits Muumuu House. For Anelechuku “Blue” Okoye, fateful life explodes the day he decides to leave college, to drop everything and move to Hong Kong to teach himself to draw comics. To call it a mistake would only be one way to look at it . . .
Uzodinma Okehi lives, breathes, writes, and draws comics in New York City. For issues of his zine, Blue Okoye, find him at: okehi@hotmail.com.